Long-term organic fertilizer from Japan, used by Master Masahiko Kimura. Abrakas consists of soy beans, bone meal, rapeseed and minerals. Japanese organic fertilizer for all conifers, leaf-trees and azaleas. Promotes the growth of roots and supports the recovery of the plant after repotting. 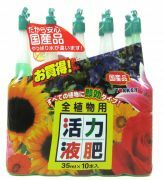 This organic slow-release fertilizer from Japan for all conifers, leaf-trees and azaleas is one of the most popular product in Japan in the field. 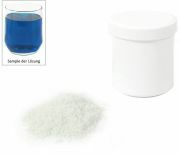 Mineral fertilizer salt with high nutrient content for the complete supply of all types of bonsai, regardless of the substrate. Mineral fertiliser salt with high phosphate content. Promotes root formation and flower development in bonsai. Mineral fertilizer salt with high urea content. Fixes quickly and safely nutrient deficiency, intensifies significantly the colour of the leaves and increases the new budding. Mineral fertilizer salt with high potassium content. Increases frost and drought tolerance of the tree and prepare him well for the winter period. In comparison with Bio-C2, the nutrient combination has been improved! Delivers high-quality nutrients to all kind of outdoor plants. For all conifers and ornamental trees. Original "Green King 365 Top Dressing" is an "all year round fertilizer" preferred by many Japanese bonsai masters. For all plants weakened in the root area (e.g. yamadori, bonsai after repotting ...) and for the strengthening of all types of bonsai. This special bonsai fertilizer is a P-K solution for the fertilization of leaves in autumn. It gives your plant strength during winter and helps it for a fresh and healthy budding in spring. Liquid mineral fertilizer with vitamins, hormones and trace elements. With ist low nitrogen content Mairol Bonsai-Fertilizer is exactly adjusted to the peculiar growing conditions of these delicate trees. A balanced mix of nutrients thought to provide a qualitative growth of leaves, flowers, and roots. Organic fertilizer, based on the dropping of the larval stage mod mealworm beetles (flour worms), thermomechanically processed into pellet shape. The right balanced mix of nutrients thought to provide energy to the leaves and roots of your bonsai. NPK fertilizer 7-4-7 with trace elements and complexing agent EDTA. 6% N Total Nitrogen, 4% P2O5 Total phosphate, 5% K2O water-soluble potassium oxide. Trace elements: boron, iron, magnesium, copper, manganese, molybdenum, silicon, germanium. 5% Guano and 45% homeopathic pesticide consisting of plant extracts and minerals in potentised form. Natural organic plant-activating solution made from rapeseed cake. 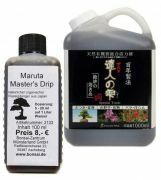 Since Master's Drip is already fermented, it produces no unpleasant odor and it can be used not only in the garden, but also for indoor bonsai. Insects are kept away and the plant will be strengthened. Suitable for all plants. Dosage: approximately 1 teaspoon for a 10x20 cm² pot. 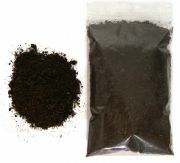 Organic fertilizer made from grape-ester-extract. HomeoCult bonsai plant is an homeopathic booster for bonsai. With homeopathy tended bonsai develop a good root growth. Nutrients and trace elements may be more easily absorbed. Blockages are released. It activates the soil life. Biological and therefore harmless to humans and animals. For the care, strengthening and invigoration of deciduous and conifers, bushes, fruit, vegetables, lawns, ornamental plants, orchids and flowers. Waldleben consists of amino acids, amides and carbohydrates which is obtained in controlled enzymatic degeneration of proteins and starches from agricultural crops. Nitrogen free fertilizer, it boosts budding and flowering, strengthen the tree before winter, promotes the grwoth of a thick trunk and improves the root growth. To be added to the irrigation water or to be sprayed on the leaves. 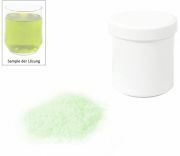 Bio-alg is a 100% organic stimulant, that can be applied in combination with other bonsai fertilizers. It gives the foliage more colour and increases the plant resistance to diseases. Produced from 100% seaweed (cold pressed): trace elements, minerals enzymes, hormones and plant growth amino acids. Fich-Emulsion is a 100% liquid organic fertilizer for indoor and outdoor bonsai, especially for azaleas. 4 ml to 1 litre of water every 10 to 14 days from April to the end of summer. Bio-Green is a 100% organic bonsai fertilizer. It stimulates the root formation and protects the tree from diseases. 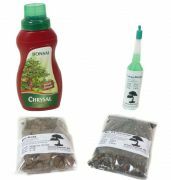 Bio-Green can be used for either indoor and outdoor bonsai. 5 ml to 1 litre of irrigation water every 2 weeks. Biogold Vital is a full-organic, stimulating substance made in Japan which stimulates the metabolism of your plants. It boosts the defences and leads to a quicker and richer growth. Particularly suitable for treating sick and weakened plants and after repotting. HB101 is a highly concentrated, growth enhancing plant vitalizer from Japan. Ionised calcium and sodium, as well as extracts gained out of ceddar, pines, cypress and plantain belong to the components. HB101 to be sprinkled or to be mixed into the soil when repotting. Identical content to HB-101 liquid. 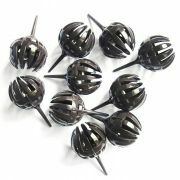 The pellets allow to obtain a long-term effect without having to frequently mix it into the soil. Yorkey is a Japanese vitamin and hormone preparation. It is used in addition to the usual fertilizer and is especially suitable for weakened plants after repotting or after a pest infection. Neudofix improves the rooting of cuttings, young plants and other repotted ornamental plants. It consists of 100% algae meal and activates and accelerates root growth, which leads in a short time to a strong and deep root system. Fungal spores added to a peat substrate as a soil stimulant. "Mycorrhiza" describes a form of symbiosis between fungi and plants. To the improvement of flat surfaces and as addition when planting, especially for Ericaceae (including azaleas). PH and PH-Minus-Plus has been specially developed to be used with Boncoco substrate but is likewise suitable for all other soils.